Paizo Publishing has enlisted the help of Mike Selinker and Lone Shark Games to create the Pathfinder Adventure Card Game. Based on the roleplaying game’s first adventure path, Rise of the Runelords, it will be a cooperative card game for 1-6 players. As the card game will attempt to capture the Pathfinder experience, Paizo says “As you explore and overcome challenges, you’ll improve and customize your character deck by acquiring new items, allies, weapons, and more.” The new card game will release at Gen Con 2013 at $59.99 for the Rise of the Runelords Base Set – nearly 500 cards. The base set will be followed bi-monthly by 110-card Adventure Decks at $19.99 apiece. This product line strategy seems similar to Fantasy Flight’s “Living Card Games” which continue to infuse their card games with new releases/expansions while shedding the frustrations of a collectible card game. The full press release is after the click. REDMOND, WA (February 26, 2013): Paizo Publishing, LLC, leading publisher of fantasy roleplaying games, novels, game accessories and board games, announces today the Pathfinder Adventure Card Game, to be released in August 2013 at Gen Con Indy and at game stores everywhere. Designed by Mike Selinker and Lone Shark Games, the Pathfinder Adventure Card Game (PACG) translates the most popular Pathfinder Roleplaying Game (RPG) into an entirely new breed of card game, where players adventure, battle monsters and villains, and acquire new feats, items, weapons, and allies – all without a Game Master! 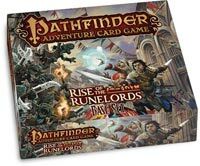 The adventure begins with Pathfinder Adventure Card Game: Rise of the Runelords Base Set, featuring the characters, locations, monsters, and villains of the first chapter of the award-winning Rise of the Runelords Adventure Path. The Base Set includes dice, nearly 500 illustrated cards, and everything one to four players need to create characters and begin their adventures for an entirely new Pathfinder gaming experience. A 110-card Character Add-On Deck introduces more classes, new cards, and allows for up to six players. The story will continue in bimonthly Adventure Decks, each containing 110 cards featuring new scenarios, villains, loot, weapons, and items, as well as additional copies of some of the game’s most useful spells, blessings, and allies, to give players everything they need to expand their adventures. The Pathfinder Adventure Card Game: Rise of the Runelords Base Set will be packaged in a gorgeous 14″ x 14″ box featuring brand-new cover art from superstar artist Wayne Reynolds, and will be available through paizo.com as well as hobby game retailers nationwide, with an MSRP of $59.99 for the Base Set and $19.99 for the Character Add-On Deck and bimonthly Adventure Decks. To get 20% off the cover price, players can sign up for an ongoing Pathfinder Adventure Card Game subscription, which automatically delivers new PACG releases when they are available. This subscription can be shipped with other Paizo subscriptions for further savings. Lone Shark Games is a design studio in Seattle headed by designer Mike Selinker. They are responsible for the design of the games Lords of Vegas, Unspeakable Words, Pirates of the Spanish Main, and Harrow and the Titanic Games board game line for Paizo. Their game books include The Kobold Guide to Board Game Design, Dealer’s Choice, Puzzlecraft, and the upcoming puzzle novel The Maze of Games.